Honeymoon Offer – Stay for your honeymoon and save up to 50% on your room rate. Please contact us for further details. One&Only Le Saint Geran is a magnificent property. Escape with views of the lagoon or the never-ending crystal clear waters that Mauritius has to offer. True to One&Only form, Le Saint Geran is unspoilt and fascinating. For an ambient holiday, Le Saint Geran offers only 162 suites, becoming a tranquil experience for holiday makers; with access to the tropical green oasis that is your back garden. Activities include a Kids and Teens Club, fitness centre, a 9 hole golf course and One&Only Spa; for an invigorating, holistic experience. Le Saint Geran offers exquisite delights to tickle your taste buds; whether scrumptious Agyu beef or heavenly seafood. The accommodation in comforting and lavish; the surrounds natural and harmonious. Let the gentle breeze and sway of the exotic greens become your soundtrack to your One&Only Le Saint Geran vacation. Up to 40% Off – Save up to 40% on applicable accommodation rates. Complimentary Half Board – Receive complimentary Half Board on applicable room rates. The One&Only Le Saint Geran is a heavenly experience, which will warm your core with delight. With such beautiful settings, your honeymoon memories will last a lifetime and your idyllic stay a honeymoon unrivaled. 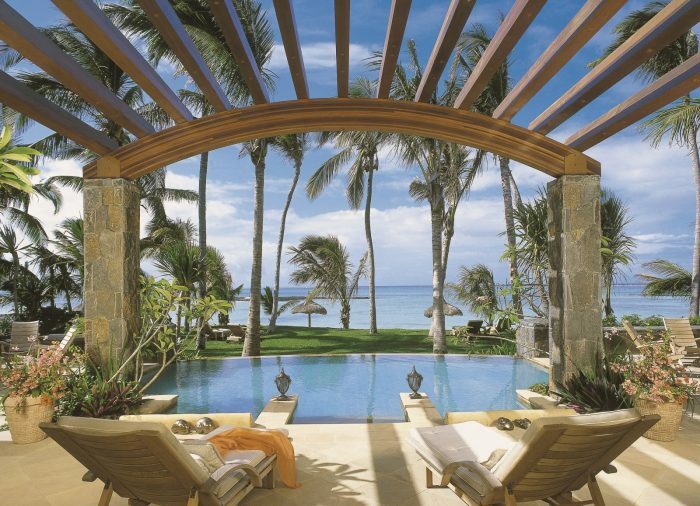 Providing luxurious French influenced accommodation makes Le Saint Geran a majestic retreat. Some suites offer outdoor rain showers and others a view of the calm lagoons. Whichever takes your fancy, Le Saint Geran spoils every couple with its natural beauty. The rich colours and aromas make your senses come alive. For a romantic dinner, enjoy a private dining experience; the emerald and turquoise ocean and the sky illuminated by purple, red and orange, form your backdrop for the evening, the fine dining of Le Saint Geran bringing your palette to life. Dining of an evening should be celebrated – get your glad rags on and enjoy what Le Saint Geran has to offer. Prime – This grill house is chic in style, stylish in decor and offers a relaxed ambience. With an extensive menu including Angus Wagyu beef, truffles and Rock Lobster, you will not be disappointed or stuck for choice. Elegantly presented an enriching your every sense, you will be mesmerised by the signature dishes. Good food is best served with wonderful full bodied wine; and if you are celebrating Champagne flutes are ready for clinking. La Terrasse – located by the pool, local ingredients create international menus worth waiting for. Sip Mauritian tea as you laze the day away and as the day passes, you can enjoy the locally caught fish of the day. By night, try the Creole local cuisine and prawns fresh from the ocean. Compliment the dishes with other Asian inspired dishes for lovely, authentic tasting delights. Indian Pavilion – lets spices, colours, scents and textures invigorate your taste buds. The open kitchen swallows guests up and your imagination takes you to India. Innovative cooking gives you the traditional menus featuring kebabs and parathas and the Sommelier has uniquely chosen wines to compliment the aromatic, spicy, rich tastes of India.